After a brief absence, 99¢ T-Mobile prepaid SIMs are back! Now though 8/13/15, T-Mobile prepaid phone SIM kits are 99¢ on the T-Mobile USA Website when you use promo code SIM99 at checkout. The prepaid phone 3-in-1 SIM Starter Kits include a nano SIM with mini and micro adapters and an activation code. The activation code is required when activating a new line of service on any T-Mobile prepaid phone plan, including the $30/month 5 GB of data, unlimited messaging and 100 minutes plan, which is only available with new online activations. If you have a tablet or mobile broadband device, T-Mobile has an even better deal for you. Mobile broadband SIMs in your choice of mini, micro and nano sizes are FREE when you order from this T-Mobile Web page now though 8/13/15. 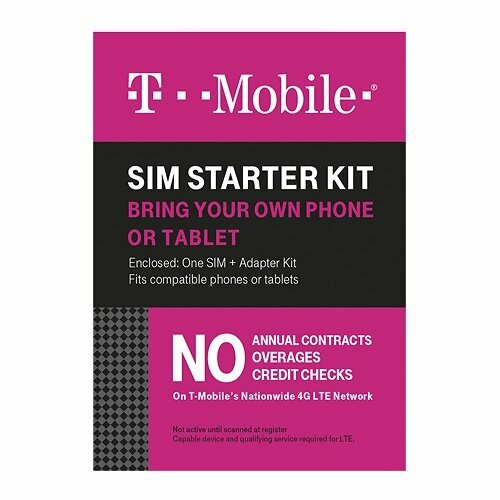 These SIMs can be used to activate a tablet or hotspot on any T-Mobile Prepaid or postpaid Mobile Internet plan. They also let you activate a supported tablet on T-Mobile's Free Data for Life plan which comes with 200 MB of data per month absolutely free. The broadband SIMs do not include a prepaid activation code so they won't work for activating a phone on a T-Mobile prepaid plan. Either type of SIM can be used as a replacement SIM for any T-Mobile account, postpaid or prepaid. Why is there a credit check before you buy if these are prepaid simcard. I don't want it to check my credit. I want to buy it without haveing a credit check. What do you mean, a credit check? I've bought a few SIMs from T-Mobile and you just need a credit card and a shipping address. Well go try it yourself. When you checkout it ask if its ok for credit check. before you pay. There be some kind of glitch in the system. Before I try it and when I was about to checkout and ask for credit check. now when I did it again. it don't ask. oh well. Bought the sprint prepaid lg g2 from best buy. Sprint would only activate it with a contract as they said it was a contract phone. Boost said the would not activate it. Ringplus alone did activate it. Any way o can use it with sprint or boost if they said no. Any other carriers? If it's a Sprint Prepaid phone, then I'm surprised it won't activate with Sprint Prepaid service. In addition to RingPlus, you could try Ting or FreedomPop? I planned on using a Sprint LG G2 from Best Buy on Boost as well. Can the G2 be reskuued / reprovisioned by Sprint or Boost customer service to be used on Boost? I read a post about this issue on this website about a month ago. The poster said Best Buy was slow to release the G2 from their system if I understood him correctly. I would love clarification on this as I planned on porting to Boost this month. Any advice on this issue would be appreciated. I bought a couple of these SIMs the last sale ( a week or two ago). The 3-in-1 phone SIM was a nano with two adapters. The 3-in-1 broadband SIM was a mini/micro/nano combo SIM. First time I have seen combo SIM with the nano cut-out as well.